Download "RSSI LED IP-67. Virtual. 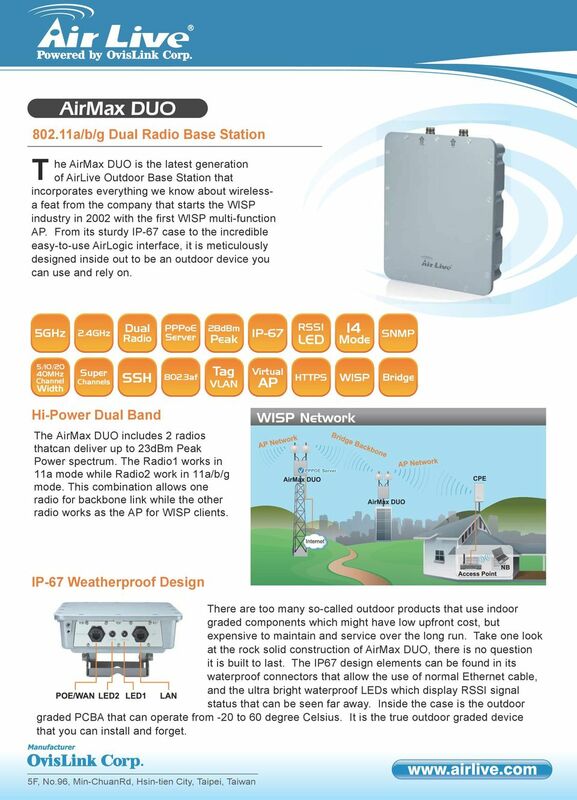 HTTPS WISP Bridge"
1 AirMax DUO a/b/g Dual Radio Base Station T he AirMax DUO is the latest generation of AirLive Outdoor Base Station that incorporates everything we know about wirelessa feat from the company that starts the WISP industry in 2002 with the first WISP multi-function AP. From its sturdy IP-67 case to the incredible easy-to-use AirLogic interface, it is meticulously designed inside out to be an outdoor device you can use and rely on. 5GHz 2.4GHz Dual Radio PPPoE Server 28dBm Peak IP-67 RSSI LED 14 Mode SNMP 5/10/20 40MHz Channel Width Super Channels SSH 802.3af Tag VLAN Virtual AP HTTPS WISP Bridge Hi-Power Dual Band The AirMax DUO includes 2 radios thatcan deliver up to 23dBm Peak Power spectrum. The Radio1 works in 11a mode while Radio2 work in 11a/b/g mode. This combination allows one radio for backbone link while the other radio works as the AP for WISP clients. IP-67 Weatherproof Design There are too many so-called outdoor products that use indoor graded components which might have low upfront cost, but expensive to maintain and service over the long run. Take one look at the rock solid construction of AirMax DUO, there is no question it is built to last. The IP67 design elements can be found in its waterproof connectors that allow the use of normal Ethernet cable, and the ultra bright waterproof LEDs which display RSSI signal status that can be seen far away. Inside the case is the outdoor graded PCBA that can operate from -20 to 60 degree Celsius. It is the true outdoor graded device that you can install and forget. 2 PPPoE Authentication Server The AirMax DUO is equipped with PPPoE authentication server. WISP operators can use the built-in local accounts or use a remote radius server for account management. PPPOE Server The AirMax DUO combines authentication, backbone, and base station into one single device. Variable Channel Width and Super Channel Support The AirMax DUO s channel width is adjustable between 5/10/20/40MHz. So you can optimize your network according to the interference and bandwidth conditions. For service providers that have license to operate in the 4.9GHz or 6GHz spectrum, the AirMax DUO has built-in Super Channels support. It opens up more than 140 chanels for you to choose from. Best yet, you do not need to pay extra for software license. 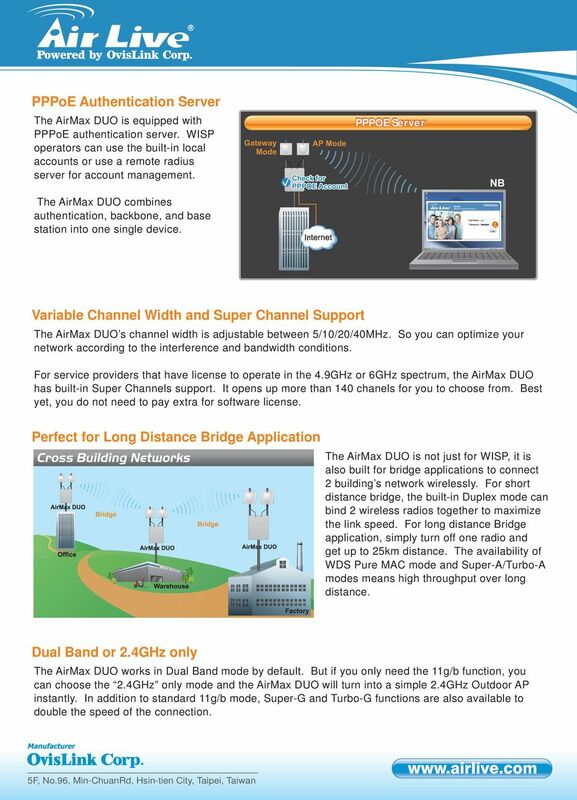 Perfect for Long Distance Bridge Application The AirMax DUO is not just for WISP, it is also built for bridge applications to connect 2 building s network wirelessly. For short distance bridge, the built-in Duplex mode can bind 2 wireless radios together to maximize the link speed. For long distance Bridge application, simply turn off one radio and get up to 25km distance. The availability of WDS Pure MAC mode and Super-A/Turbo-A modes means high throughput over long distance. Dual Band or 2.4GHz only The AirMax DUO works in Dual Band mode by default. 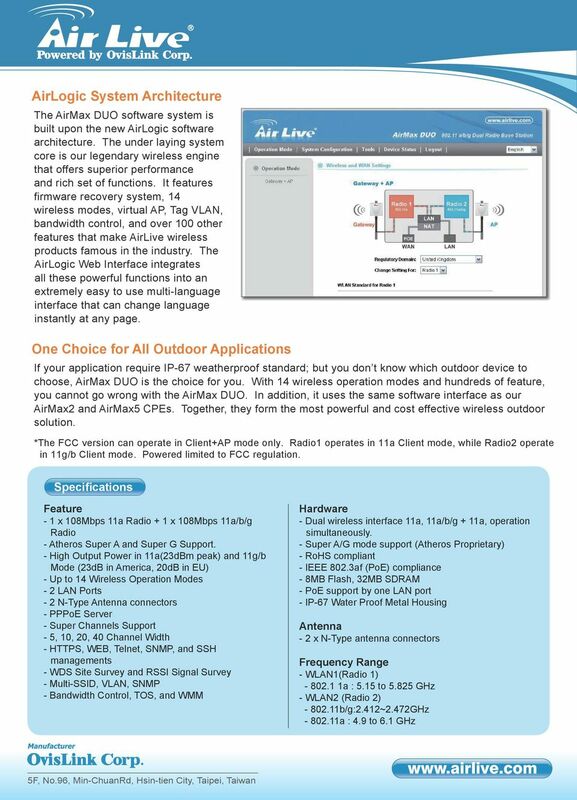 But if you only need the 11g/b function, you can choose the 2.4GHz only mode and the AirMax DUO will turn into a simple 2.4GHz Outdoor AP instantly. In addition to standard 11g/b mode, Super-G and Turbo-G functions are also available to double the speed of the connection. 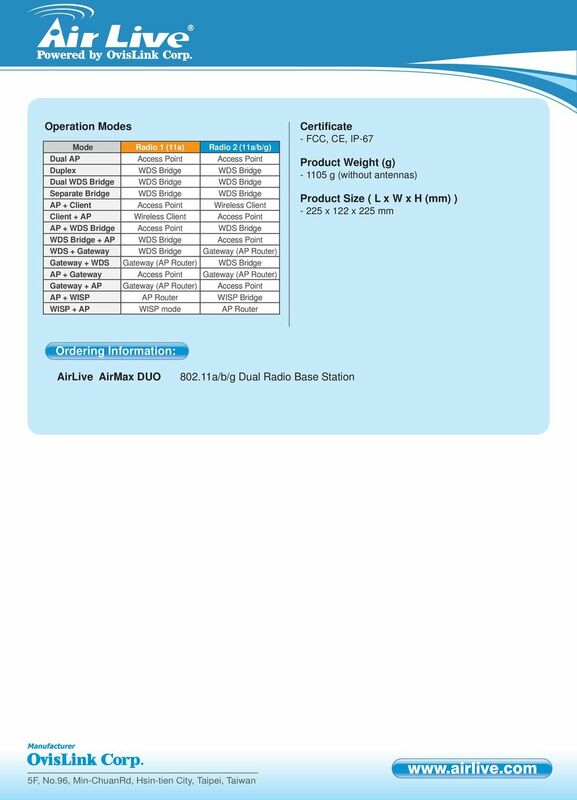 -b/g/n Long Range PoE Access Point E ver since AirLive introduced the world s first multi-function in 2002, the AirLive access points have been renowned for their reliability, performance, and rich features. Key Features. Multiple Operation Modes ENH500 can operate into four different modes with Access Point, Client Bridge, Client Router and WDS Mode. 802.11b/g/n SOHO Router 2.4GHz 150Mbps 11N AP/Router ESR-9753 PRODUCT DESCRIPTION ESR-9753 is a 1T1R Wireless Single chip 11N Broadband Router that delivers up to 3x faster speeds than 802.11g devices. Key Features. EnGenius Outdoor Base Station designs High Power, High Sensitivity and Strong Reliability Solutions under Harsh Environment. Overview. Datasheet. Application Examples. InnerFeed Technology. airmax Technology. airmax TDMA Technology. PtMP Client Links. EPI-3601S Wireless LAN PCI adapter Version 1.2 EPI-3601S. Wireless LAN PCI Adapter. 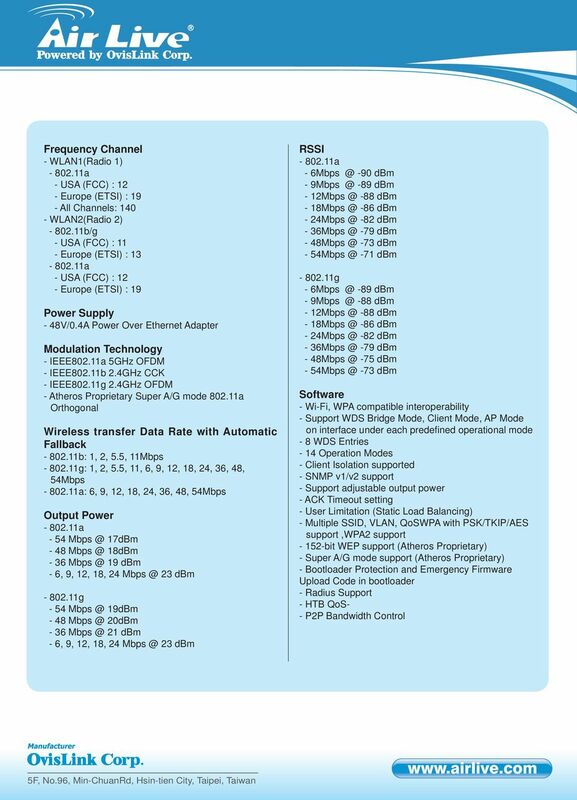 (802.11g & 802.11b up to 108 Mbps) User Manual. Version: 1.